California is violating the federal Constitution when it punishes prison inmates after a riot based on their race, the U.S. Department of Justice said Friday. Gangs in California prisons typically are based on race, and riots often pit members of one race against one another or involve inmates of only one race. After the riots, officers often lock inmates in their cells based on which races were involved to prevent further violence - whether or not those inmates were involved. The Justice Department said in a court filing that the practice violates the 14th Amendment, which requires equal protection under the law. The opinion is not binding, but is part of an ongoing class-action lawsuit in federal court in Sacramento. The policy "is not based on any individual analysis of prisoner behavior, but rather on generalized fears of racial violence. Indeed, the policy affects hundreds of prisoners throughout the (prison) system who the state acknowledges have absolutely no gang ties or history of violence," according to the filing signed by the chiefs of the Justice Department's Civil Rights Division. The state could adopt race-neutral alternatives, the Justice Department said, including locking up specific inmates who it suspects were involved in the fight, or locking down entire housing units where the riot occurred. It could also do a better job of gathering information in advance on which inmates are involved in gangs or are likely to engage in race-based violence and keep them separated. Corrections department spokeswoman Terry Thornton said the state's policy is not to base lockdowns "solely on the inmate's race or ethnicity." State law says the department "shall not target a specific racial or ethnic group unless it is necessary and narrowly tailored to further a compelling government interest." The U.S. Justice Department contends that the policy is too broadly written to pass constitutional muster. The lawsuit was filed in 2008 by Robert Mitchell after he was locked in his cell following a fight at High Desert State Prison in Susanville. The Department of Corrections and Rehabilitation imposes more than 600 lockdowns in a typical year, at least 200 of which are based on the race of the inmates, said Rebekah Evenson, whose nonprofit Prison Law Office represents Mitchell and other inmates. No other state has a similar policy she said. "They lock down people who were not involved in the incident, not involved in the gang and just happen to have the same color skin," she said. The policy is similar to another California practice that the U.S. Supreme Court found to be discriminatory nearly a decade ago, the practice of segregating inmates by race in their cells and sleeping areas to prevent gang violence. I don't understand why they would come up with this law in the first place. Even though gangs are usually segregated by race it makes no sense to lock up all of the members of a certain race even though a majority of them might not have been involved. I agree with the solution that individual housing quarters should be locked up when the members of the fight are unknown. This article just paints such a bleak and disappointing picture of race in America. The prison system, as described in the article, almost serves as a microcosm of race in our country. Violence and senseless actions by one racial group against another provoking the institution of regulations further driving a wedge in between races. A vicious cycle, and unfortunately I don't see an easy way to break it. I do think that the policy of separating prisoners by race is uncalled for and only begets more anger and frustration that turns into racial violence. To me, it would almost be helpful to force the prisoners into the same small space because then they have no choice but to deal with integration. I do not understand why California continues to lock down people merely because of their skin color. There are more just and more reasonable alternatives that are presented in this article such as only locking down inmates who are suspected of being involved in the fight. The unfair treatment of the inmates would not be accepted in free American society and therefore should not be allowed in prisons. In fact, locking down all inmates belonging to a certain race would only incite a sense of hostility in the inmates which would only make the problem worsen. This type of occurrence is so outdated it blows my mind that it still takes place. How can we not move forward as a society even if it concerns those who are in prison? This has direct relation to the internment of Japanese following WWII based solely on skin color. I understand that being in prison one loses many rights but this cannot be one of them. Maybe if race riots were being planned such internment could stop possible outbreaks but the repercussions of outbreaks falling on those who didn't participate is unnecessary. Prions could use race as a preventative factor but not as a punishment means. It is time to move on as a society. I think that this policy is indeed racist and a violation of the Constitution. Under the Constitution, citizens of this country have equal protection and treatment under the law. The fact that these people are being incarcerated in different areas because of their race and which races were involved in the riots is completely generic and, frankly, an example of racial profiling. We do not tolerate such behaviors such as in Arizona when they were about to racial profile, so why should California be allowed to continue such behaviors and practices in their prisons? Instead of separating by race, they should lock up individuals that were solely involved in the riots, and that's it. They don't know who was involved in the riots. If they knew who was involved, then we wouldn't have this problem. We need more alternatives. I agree that this policy they are implementing is a clear representation of racism. Americans continue to state are we are a country based on freedom and choice. Now understandably so inmates are incarcerated for a reason and there is some type of criminal background that landed them where they are, but locking people up due to the color of their skin when a riot occurs is not right. 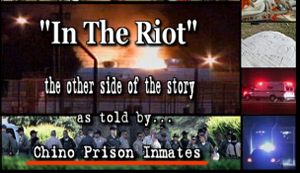 Prison riots are not something to be taken lightly as those that are involved need to be considered as dangerous but to classify all "whites, african-americans, mexicans, etc." in the same grouping is something that will only create more anger and issues within prisons. There needs to be some type of system implemented that allows guards to determine whom has been involved leaving those prisoners that had zero involvement out of any punishment/lockdown. This is crazy that they lock down on certain races just because one group of people got in a fight. Unfortunately I don't think this just happens in prisons though. If crimes happen with one race it is likely that the community will be more scared of people of this race. Even though all races have had terrible crimes. The crime is committed by the person not by the race. It is unfair to penalize an entire race just because one person or group messed up. I think that this policy is unfair and totally outdated. In this day we can have the technology to do a better job at stopping these riots and such violence in prisons but the sad part is, that the prison guards dont feel it necessary to do such things. I think that they are trying to find the easiest way out of doing what their job entails. I think that this policy is racist and that if no other jail has this certain rule that why does this jail need to have it ? This new policy is interesting. I can see that this policy reflects how correctional facilities are trying to take the most precaution, in the easiest way, when it comes to the safety of the prisoners. However, I believe that this policy will draw more racial debate oppose to addressing the safety issues. This policy may be easier for correctional officers to just separate riots based on race because they would not have to interrogate the prisoners to see who was directly involved in the riot. This method should not be implemented into correction facilities. Racial generalizations could create more error when deciding who was actually involved in the riot. In other words, innocent prisoners may be accused of something they did not do, solely, base on racial profiling, which is unconstitutional. I personally think that is unfair. I do not understand why California continues to lock down people merely because of their skin color.This policy may be easier for correctional officers to just separate riots based on race because they would not have to interrogate the prisoners to see who was directly involved in the riot, but it still wont stop them all. so I don't see why this was even put in to place. Its outdated and no other jail has this, so why do they? I see why the public views this as racist, but honestly, what else can be done here? I can see how gang violence in prison would be related to race and that the officials would have to separate the races involved. To me that part makes sense because it is for the protection of everyone. I don't understand if they can lock down the unit where the riot happened, why would they locked down the entire prison population? That part does not make sense if the person is not involved in a gang or affiliated, then they should not have to suffer lockdown. This law doesn't really make sense.. I personally think there are a lot of laws should be reconsidered.